Note: The $450 million in funding allocated for the SEAS priority overlaps with that of other priorities. UPDATED: Oct. 26, 2013, at 12:43 p.m.
Harvard’s Faculty of Arts and Sciences will seek to raise $2.5 billion in its portion of The Harvard Campaign, FAS campaign co-chair Carl J. Martignetti ’81 announced to hundreds of alumni, donors, and affiliates gathered at an official launch event Saturday morning in Sanders Theatre. 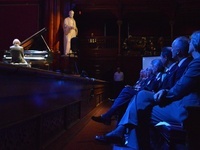 That goal, which comprises a little more than a third of the record-breaking $6.5 billion the University hopes to raise in the coming years, makes The Harvard Campaign for Arts and Sciences the largest subset of the overall fundraising effort. Martignetti told the crowd that the campaign has already raised just over $1 billion to date from 93,000 individual gifts, meaning that the average gift has been almost $11,000. While campaign leaders did not offer financial goals for each of the priorities during Saturday morning’s events, campaign literature distributed to attendees shows that FAS aims to bring in roughly $600 million for Financial Aid, $600 million to fund Faculty and Our Scholarly Enterprise, $500 million for House Renewal and the Student Experience (split between $400 million for the former and $100 million for the latter), $450 million for SEAS, $150 million to fund Leading in Learning, and another $250 million to fund the Dean’s Leadership Fund. The campaign launch comes at a critical time for FAS. In the Dean’s Annual Report for academic year 2012-2013, which was released to faculty earlier this month, both Smith and Dean for Administration and Finance Leslie A. Kirwan ’79 said that FAS has yet to fully recover from the damage inflicted by the financial crisis. Both administrators said that the body was looking towards the campaign as a source of sustainability for FAS. Though it remains the largest piece of the University’s total goal, FAS’s proportion of the overall funds has dipped slightly since the last University-wide campaign, which ran from 1994-1999. During that campaign, FAS was projected to account for a little more than 46 percent of total funds raised, compared to an expected 38 percent today. 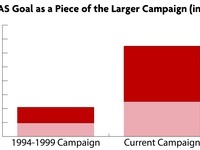 The 1990s campaign ultimately raised $1.1 billion for FAS. In her own remarks Saturday, University President Drew G. Faust emphasized the centrality of FAS to the University’s mission and campaign, arguing that the body represents not only the Harvard’s history but the engine that drives it forward. 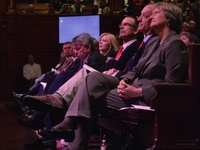 In addition to Smith, Faust, and Martignetti, attendees gathered in Sanders Theatre Saturday morning heard remarks from FAS campaign co-chairs Paul B. Edgerley, Sandra M. Edgerley ’84, Glenn H. Hutchins ’77. 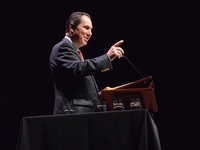 After the event in Sanders, donors and other guests could choose to attend any one of a series of symposia hosted by faculty and administrators across campus. Topics for the symposia included residential life, financial aid, and digital education, among others. This weekend’s attendees were also invited to eat lunch in the Science Center Plaza, and then to attend the football game against Princeton.